Cats feel a lot better when they feel in control of their environment. Anything that interrupts their feeling of control can make cats unhappy. Over time this can raise your cat's stress levels and lead to anxiety. To feel in control, cats will carefully mark their home with pheromones. This happens each time a cat rubs its face against furniture or nuzzles against your legs. Many things can disturb your cat’s need for stability, and lead to cat stress. When this happens your cats become disorientated, and show signs like hiding, scratching or peeing - in your cat’s language, it’s a sign of cat stress. Other things that may affect your cat's happiness are access to food, heat, water, litter, attention and competition in the household with other cats, as well as visitors to the home. If you feel that your cat is unhappy or suffering from cat stress, FELIWAY can help. Note: most calming aids do not address the underlying issues whereas FELIWAY provides calming support by releasing pheromones to your cat in its environment. 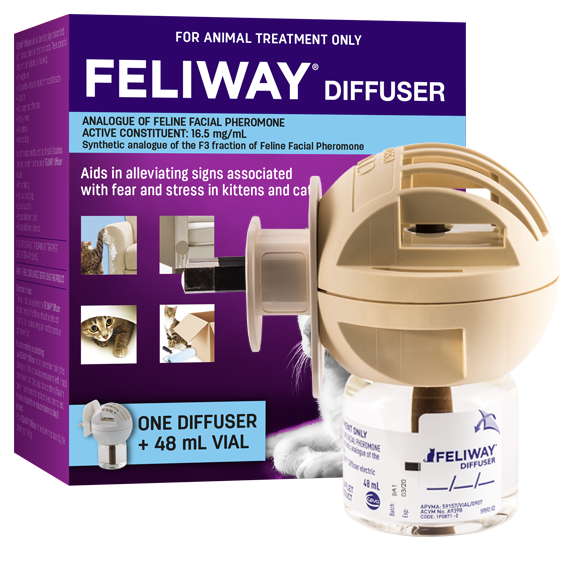 FELIWAY Diffuser helps you nurture your relationship with your cat, by creating a loving environment for them.